Staghorn ferns are fascinating specimens. While they reproduce through spores, a much more common method of propagation is through pups, small plantlets that grow off of the mother plant. Keep reading to learn more about removing staghorn fern pups and staghorn fern pup propagation. What are Staghorn Fern Pups? Staghorn fern pups are little plantlets that grow off of the parent plant. In nature these pups will eventually grow into new, whole plants. The pups will be attached underneath the brown, dry shield fronds of the plant. Gardeners have two choices: removing the pups and propagating new plants to give away or allowing them to remain in place to form the appearance of a much larger, more imposing single fern. The choice is up to you. If you choose not to remove your staghorn fern pups, they will grow bigger and bigger and might even reach the size of the parent plant. They will also keep increasing in number. 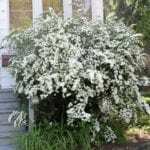 The result is a very attractive covering of fronds that can span 360 degrees in hanging baskets and 180 degrees on wall mounts. It’s a spectacular look, but it can also get big and heavy. If you don’t have the space (or your wall or ceiling doesn’t have the strength), you might want to keep your fern more contained by thinning out some pups. How Should I Remove Staghorn Fern Pups? Pups are the main source of staghorn fern propagation. Removing staghorn fern pups is easy and has a very high success rate. Wait until the pup is at least 4 inches (10 cm.) across. Find the spot under the brown shield fronds where the pup is attached and, with a sharp knife, cut the pup away with some roots attached. You can mount the pup just as you would a fully grown staghorn fern. 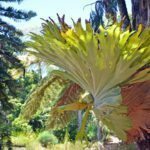 Read more articles about Staghorn Ferns.